The last two decades have provided a slew of new earth system observations from low earth orbiting satellites. Using these tools, oceanography has gained the ability to track sea level, circulation, ocean winds and waves, and surface temperature at increasing levels of resolution and accuracy. Numerous ongoing projects within the UNH Ocean Process Analysis Laboratory are contributing to these refinements in satellite measurements and applications. This talk will present new results from a couple perspectives. One key ocean state variable that has yet to be measured from space is seawater salinity. 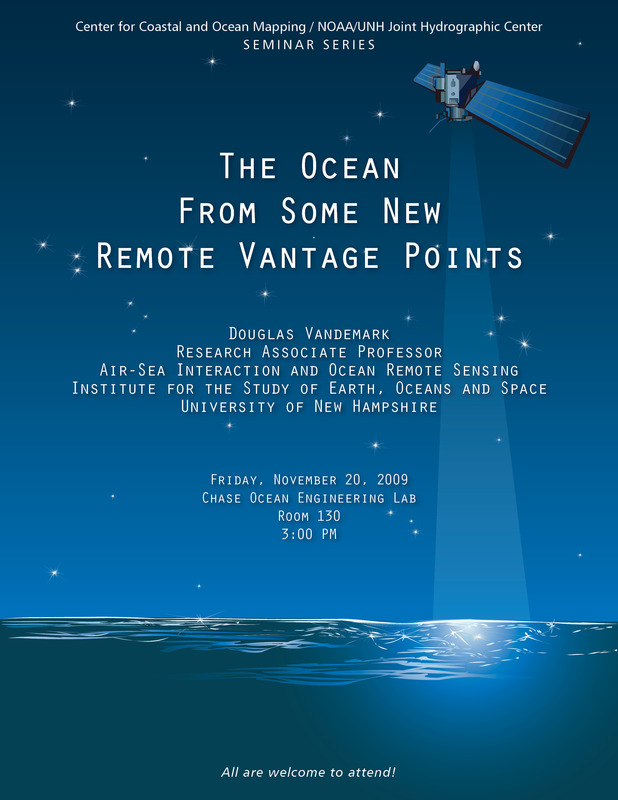 However, this is about to change, and recent results from our team showing first ocean views of surface salinity in the equatorial Atlantic will be discussed along with detail on new dedicated salinity observing missions being launched by ESA and NASA in 2009 and 2010. In a separate vein, the use of satellite ocean color imagery to study ocean phytoplankton dynamics is a central OPAL research theme and a new approach to evaluating the impact of horizontal advection on ocean color time series data will be presented. Using the Gulf of Maine as an example, I'll discuss how an ocean circulation model is used to help interpret surface layer carbon production rates under a Langrangian rather than Eulerian viewpoint.